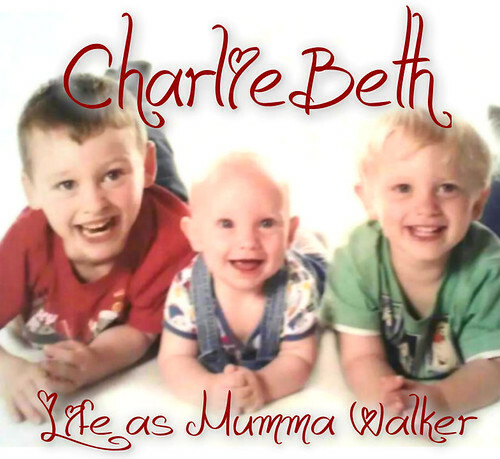 Mumma Walker's 7 Years of Pregnancy by CharlieBeth: My Easter Chick! I woke up on Thursday morning about 6 or 6.30 am with bad back ache. Not much worse than I've been having on and off for the previous days, but there and bothering me. So I got up and started pottering about as normal. I went to the loo and saw I had some tiny bits of blood... SO I checked up in my NHS Pregnancy book, and my Pregnancy & Childcare book, and they both said "Could be an early sign of labour. Contact your midwife" But it was still early, and we had to take Fizgig to the vets and call into B&Q for some more DIY stuff so I left it for a while. In fact I left it until we'd done all those things and it was going on for 10.30am. There was still bits of this blood when I went to the loo and even if this was a "show", baby could still take days to get here. But I thought I had better not take any chances. Plus this back ache was starting to throb a bit. Yorkie was getting a little more stressed as I kept him updated, and chain smoked a bit more than usual, but I assured him it could still take days! The Midwife asked how regular the back ache was, and I said about every 8 to 10 mins, lasting for about 1 min to 1 min 30. She said we were "well on the way".... i called mum and warned her to be on stand by, she might be needed the next day. So Yorkie got on with putting up the backing paper and wall paper in the kicthen, which was no where near done, but well on the way to looking good. I went down every so often to help him out when I got board of sitting or lying around watching day time TV or reading. But this damed back ache was getting worse and I was having to stop and rub my back. Eventually I went to lie down. And after a while started to call Yorkie up to help with rubbing my back. And before long was banning him from going away because I NEEDED him to rub my back. I called mum, got her to come over for about 6pm. By 5.30pm I was on the phone to the delivery suite, and Yorkie was calling a taxi! Mum was to meet us there as she was just arriving in Lancaster. At 6pm we were all there and I was already 4-5cm dilated! Not bad for a girl who thought she would be sent home again in 'false labour'. They were impressed that I had gone on so long without any pain relief. But i had Yorkie rubbing my back expertly and hadn't needed it. By 10.30 I was 8cm dilated and loving the gas & air and Meptid injections - even if they did make me sick. Fully dilated by 1am, and from here things get hazy! I think it was about 2.30am when I started to push, and this is the only nasty bit of the birth for me - mainly because I got tunnel vision and didn't clock on that I could still have gas! So it hurt! Really bloody hurt! I had to have my waters broken for me because they hadn't gone. That was ok, barely felt that. I was on my hands and knees, and then my back, alternatively to try and get Wiggles head to drop because it wouldn't. In the end I was on my back with the midwife holding one leg and Yorkie the other, providing me with extra strength for the push and the birth. Wiggle finally started to move towards the exit, but by now I was worn out. 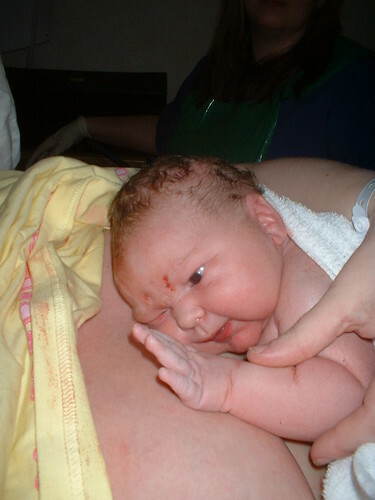 I carried on pushing with the contractions and could feel how tight the skin was. I was given an injection in case I needed cutting or tore, and tried again. I was wanting to give up. It hurt so much (curse my not paying attention to the gas mask being waved at me). Twice the push was so painful I thought I would split in half and gave up. What I didn't know was that this was Wiggle almost coming out, and I'd stopped, pulling the head BACK before it had chance to come fully out!!!!! I wanted to give up. I was on the verge of tears and begging for it to stop. I wanted help getting Wiggle out, and the forceps and vontues came out. I was stirruped and ready to be assisted. Then at 3.22 am came this last long contraction, and my body - without any permission from my screaming head - pushed Wiggle out! It took 3 pushes to get the baby out of me, the belly was almost bigger than the head and needed a push all of it's own. Oh, and then I half drowned the midwife in my waters which had been trapped behind Wiggle - hence not breaking on their own! She needed to go and have a shower and a change of clothes! Really! (Yuck). Baby was put right onto my chest, and Yorkie lifted a leg to see "It's a boy!" 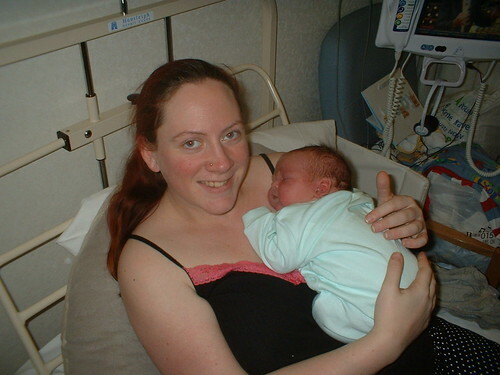 he sobbed, and I just kept saying over and over again "Hello baby, hello son, hello Jack, I'm your Mummy"
Stuff the pain, it didn't matter any more! Mum said the change that went over my face was amazing. I went from being a woman in extreme agony, to calm and peaceful (she even added beautiful, but she is my mum) in a split second. 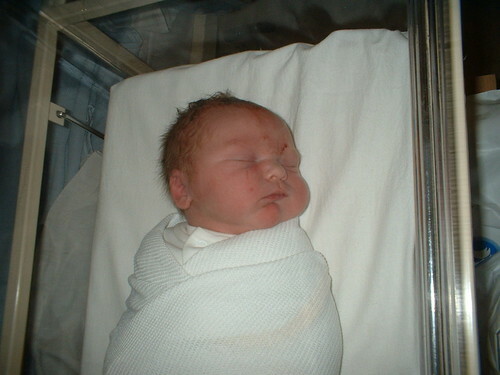 I got a good 20 or 30 min cuddle skin to skin with Jack before he was handed over to his daddy and I was talk away for my stitches. I had a 3rd degree tear which needed attention with the help of a spinal anaesthetic. Well, he wad 9lb 13oz!!! An hour later I was back with my mum, hubby and baby, to find out the Jack had passed his first poo safely (Yay!) all over his Daddy's bare flesh (Eww!). We got to stay in delivery until 7ish. My mum and Yorkie nipping out to make calls and let people know before heading back home. Jack and I were wheeled off to the ward, and I haven't been able to take my eyes off him since!